John Bartholomew founded his map-making business in 1826. It became one of the most admired cartographic institutions in the world. He was succeeded by four generations of his family, who developed the firm and its map-making techniques, until it was finally sold to Readers Digest in 1980. Currently the firm is owned by HarperCollins Publishers. John Bartholomew was born on 26 April 1805. His father, George Bartholomew, was also a mapmaker, and subsequently worked for the family firm. In 1829 John married Margaret Macgregor (1796-1864), who was about ten years older than him, and they had five children. John died on 9 April 1861. Margaret died three years later. Their headstone also commemorates a number of their descendents. Margaret (1840-1851) died at the age of 10 and George (1836-1857) died when he was 21. John Bartholomew junior (1831-1893), the eldest son, took over the business in 1859. He married Annie McGregor (1836-1872). 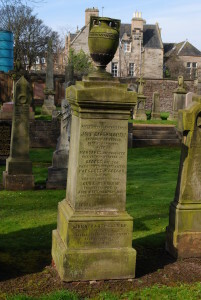 They had eight children but only one, Margaret (1861-1926), is commemorated on the headstone.